These Roadmaster seat brackets are custom designed for your vehicle and adapt your vehicle to the Roadmaster braking systems. 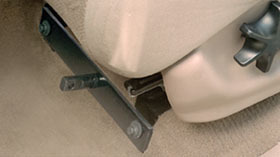 With the custom brackets installed, installing and removing your brake system is a breeze. 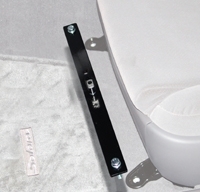 Because these seat brackets are custom designed for each vehicle, you should check the following Application Guide for the part number that fits your vehicle. Once you have identified the part number of the bracket kit for your vehicle, you can also find the installation instructions for that kit to view what parts are included and the steps for installing the kit on your vehicle. To order the correct bracket kit, please add this item to your order, and then tell us either the model, year, and make of your towed vehicle, or the Roadmaster part number of the kit you are interested in when completing the checkout process. You can enter the information in the "Order Comments" section of the checkout process. Alternatively, you can contact us by phone to complete the order process.